Resonant Circuit in Mobile Phone – Resonant Circuit is combination of capacitor and coil. Resonant Circuit passes specified resonant frequency. 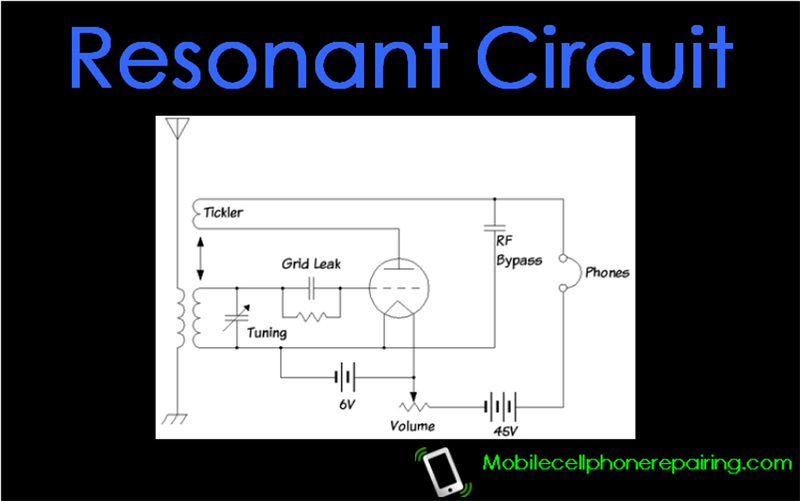 Learn More about Resonant Circuit in Mobile Phone. We have already learnt about SMD Resistor, SMD Capacitor and SMD Coil. In any circuit, a resistor influences flow of AC and DC supply whereas coils and capacitors are used to influence AC supply only. The circuits made by connecting capacitors and coils in series or parallel are called tuned or resonant circuit. Tuned circuits are capable of specified frequencies from many frequencies. Generally tuned circuits are combination of capacitor and coil. Resistance is used to control the value of signal. Every tuned circuit passes a specified value of frequency. This frequency is called resonant frequency of that circuit. In other words we can also say that the circuit is tuned to that frequency for which it is set and not for other frequencies. Setting desired resonance frequency from various frequencies by changing the values of capacitor or coil of the tuned circuit is called tuning. I have already explained about the Basic Mobile Phone Repairing Tools. Try to get them in your country and get started. i find your website a powerful tool for my students. Is it possible that we arrange for us to visit us in our University in Ghana, West Africa? i want to Run Mobile Phone Repairing Shop, Kindly send me the Basic & Usefull Tips.